Today it started to snow. 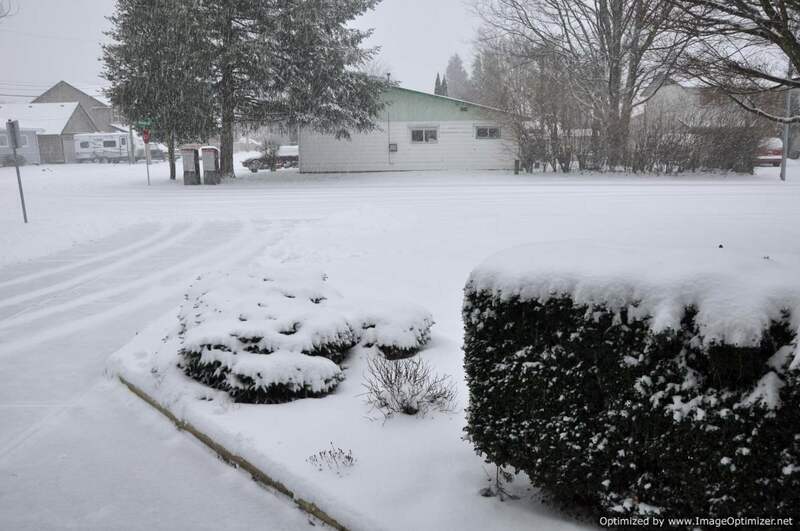 This is the first snowfall that we have seen here this winter. We have been under an extreme weather warning since last night. So while the snowflakes fell outside, I was inside sewing. Today was a perfect day to work on my FVMQG Robert Kaufman Modern It Up Challenge. Our finished quilts will be part of an exhibit that our guild has planned for the Creative Stitches Show in March 2015. The theme of our challenge was to take a traditional block / quilt design of our choice and make it modern. We were given a package of fabrics to work with that included Kona solids in Pewter, Limelight, Pool, Watermelon, Cerise, Goldfish, and three prints from Carolyn Friedlander’s Architextures line. We were permitted to add fabrics to this selection as long as they were from the Kona solids collection or the Architextures line. I ended up adding four additional Kona solids to the mix in Snow, Crocus, Flame, and a yellow that I don’t remember the name of. I deliberated for weeks on what I was going to do. I have changed my mind several times. I started out thinking I would do a modern Log Cabin and then switched to a Dresden Plate after seeing some inspirational photos on the Internet. I then switched to the idea of a Rail Fence after I picked up the latest issue of American Patchwork and Quilting and was inspired by an article by Jean Wells. I dropped the idea of the Log Cabin as I thought for sure someone else would do that one as wonky log cabins are very popular in the Modern Quilt World right now. I abandoned dresden plate after hearing several guild members talking aobut making that design. I thought I might have too many fabrics to work into a successful Rail Fence and so I also abandoned that idea. Last night I settled on the Tumbler quilt idea. A Tumbler quilt has been on my bucket list to make for a while now. I found several photos of modern versions of Tumbler quilts on the Internet and this morning I worked my way through several versions making test blocks with fabrics I already had in my stash. Those versions just weren’t working for me and I was about to abandon the idea altogether when my friend, Linda J sent me a link to a video on the Internet from the Missouri Star Quilt Company for the Tipsy Tumbler Quilt. Now this quilt was definitely speaking to me! I started working on the blocks right away and by evening, I had all my blocks made and arranged on my design wall. These are my Tipsy Tumbler quilt blocks. 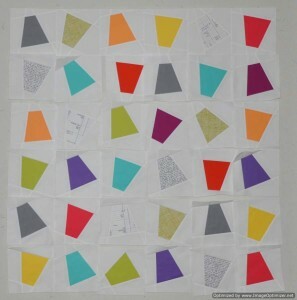 This quilt should finish around 36″ square which will put it at the maximum challenge quilt size of 144″ in perimeter. The contrast is very low for the Architexture print that looks like ledger paper. If I was making this quilt for me and not for the challenge, I would have left that print out of the mix. However, one of the rules of the challenge was that you had to use at least one piece of each of the fabrics we were given so I had to use it somewhere in the quilt. Some of the other quilters in the Guild were using that fabric as one of their backgrounds. However, it doesn’t work as a background in my quilt as I would loose the effect of floating the tumblers across the quilt top if I used it as background in some of my blocks. So I will have to come up with something to help make those blocks stand out when it comes time to quilt this top. I guess using the more difficult fabrics from the bundle is part of what makes this a challenge. This entry was posted in challenge, Creative Stitches Show, missouri star quilt company, modern, tipsy tumbler quilt by Norma Hanson. Bookmark the permalink. You know I sorta like those ghost blocks. They probably show up better in person than in a picture, I’m guessing. Otherwise they almost need some piping around them or something. HMMM. Still, I am glad that I found that link yesterday as it really made a quick top and provided resolution for the challenge idea. I might try something similar with a different shape for MY guild challenge. We’ve talked and talked about this challenge and it is good to see your progress. I only see good things. I am going to start on my mock up with practice fabrics on the weekend. Cheers! !